The term cyanosis is derived from the color cyan, which comes from kyanous, the Greek word for blue. The scattering of color that produces the blue hue of veins and cyanosis is similar to the process that makes the sky appear blue: some colors are refracted and absorbed more than others. Cyanosis is a physical exam finding in hypoxemic patients, that become visible because deoxygenated hemoglobin is more prone to the optical bluish discoloration. Cyanotic animals display an abnormal blue discoloration of the skin and mucous membranes when their absolute concentration of deoxygenated haemoglobin raises above 5 g/dL. Therefore, it is actually easier to appreciate cyanosis in animals with normal or high hemoglobin concentrations than those with anemia. Cyanosis can be classified as central or peripheral. Central cyanosis is characterized by arterial hypoxemia, due either to severe pulmonary disease or the shunting of blood from the right side of the circulation to the left (without gas exchange in the lungs). Central cyanosis may result from intrapulmonary, intracardiac, or great vessel shunts. Some common examples include tetralogy of Fallot, right to left shunting ventricular septal defect (VSD) or right-to-left shunting patent ductus arteriosus (PDA). The latter condition is characterized by “differential cyanosis” in which the caudal one-half of the body is cyanotic while the head and front legs receive blood with near normal oxygen saturation. This peculiar form of cyanosis derives from the anatomic features of a right to left PDA, whereby deoxygenated blood is shunted in the systemic circulation at the level of the proximal descending aorta, while the left subclavian artery and the brachiocephalic trunk receive blood with a higher oxygen content. Peripheral cyanosis, frequently a regional phenomenon, is present when arterial oxygen saturation is normal, but perfusion to the peripheral vascular beds (digits, ear tips) is reduced as a result of systemic thromboembolism, decreased cardiac output or vasoconstriction. In these circumstances, a larger proportion of the oxygen is extracted by the metabolizing tissues and the blood in the capillaries and venules has low O2 content. was observed, with a normal capillary refill time. Luna had a palpable left basilar thrill, and cardiac auscultation revealed a left basilar crescendo-decrescendo grade 5/6 holosystolic heart murmur, radiated to the right hemithorax. Luna’s heart rhythm was regular on auscultation, and synchronous with somewhat reduced but symmetrical femoral arterial pulses. Her lungs ausculted within normal limits. A 10-lead ECG revealed a normal sinus rhythm with an average heart rate of 120 BPM and deep S waves in lead I, II, III, and aVf, indicative of right ventricular enlargement. Thoracic radiographs (Fig.1) showed unremarkable left heart chambers, mild right ventricular enlargement, a prominent aortic arch and diminutive pulmonary vascular markings, indicative of pulmonary under-circulation. 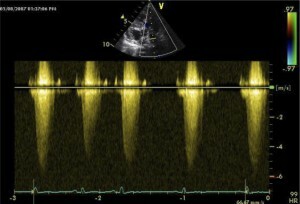 An echocardiogram (Fig. 2) showed severe right ventricular concentric hypertrophy, subvalvular pulmonary stenosis, a large sub-arterial VSD and a partially dextroposed aorta, overriding the interventricular septum. 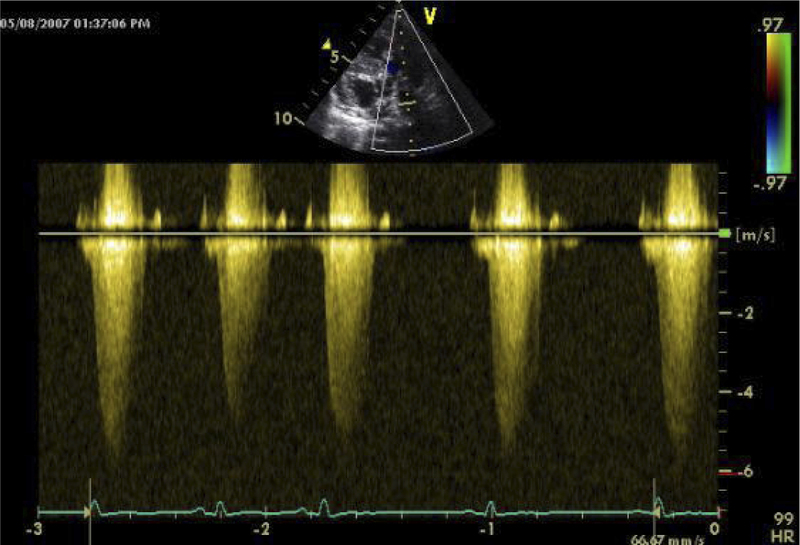 The forward pulmonary flow velocity, estimated with spectral Doppler interrogation, was about 5.8 m/s (Fig. 3), which translates into a pressure difference of approximately 135 mmHg, indicative of severe (i.e. > 100 mmHg) pulmonic stenosis. 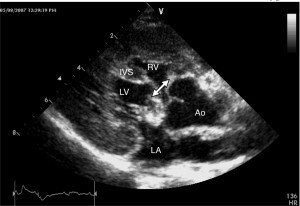 These echocardiographic findings are indicative of the complex congenital heart defect known as Tetralogy of Fallot. The name tetralogy (literally a compound work made up of four distinct works) reflects the four features of the condition: pulmonary stenosis, ventricular septal defect, overriding aorta and right ventricular concentric hypertrophy (which occurs as a compensatory phenomenon secondary to the presence of pulmonary stenosis). In the setting of an uncomplicated VSD (i.e. when the relative pressure difference between the left and right ventricle is normal) blood shunts from the high pressure left ventricle to the lower pressure right ventricle (i.e. the shunt is said to be left to right). When moderate-to-severe pulmonary stenosis is present the right ventricle is required to generate extra pressure to allow a normal amount of blood per unit of time to flow through the narrow orifice. As a consequence the right ventricular pressure increases, frequently reaching supra-systemic (i.e. above arterial pressure) levels. When this condition occurs in the presence of a VSD, the shunt reverses (i.e. the shunt becomes right to left, or “reversed” compared to the uncomplicated scenario described above). In Tetralogy of Fallot the significance of right to left shunt is enhanced by the fact that the aorta, instead of being fully committed to the left ventricular outflow tract, partially “faces” the right ventricular outflow tract at the level of the VSD, further facilitating the shunt of blood from the right ventricle to the systemic circulation. With this anatomic arrangement most of the combined left and right ventricular stroke volume (i.e. the amount of blood ejected during systole) is directed into the aorta, which usually appears enlarged on thoracic radiographs, while only a fraction is sent to the pulmonary vessels, which appear undercirculated. Tetralogy of Fallot is considered the most common cyanotic congenital heart defect in dogs and cats, although in absolute terms, represents a relatively rare condition. Repair of the defect(s) cannot be easily performed, if not with adoption of cardiac bypass. Dogs and cats affected by this disease are treated usually with a combination of palliative interventions. Although sudden cardiac death or right sided heart failure can occur, the VSD represents a “pop-off valve” for the right ventricle, thereby pulmonary stenosis per se is not the predominant factor in the overall clinical outcome. Clinical signs, so called “tetralogy spells”, mainly occur when, as a consequence of exertion, the patients experience a sudden increase in the quote of right to left shunt that suddenly and significantly increases the degree of hypoxemia and cyanosis. As we know, blood flows following the path of least resistance. Physical activity, being associated with vasodilatation in the skeletal muscles, hence reduced systemic vascular resistances, enhances the quote of right ventricular stroke volume that is redirected into the aorta. This phenomenon summates with the increased oxygen extraction and requirement at the level of the exercising muscles, and precipitates syncopal or near-syncopal events, accompanied by worsening of cyanosis. Another aspect of the pathophysiology of any cyanotic cardiac disease is that, as a response to chronic hypoxemia, the kidneys increase their release of erythropoietin, triggering an increased production of red blood cells from the bone marrow. Variable degrees of erythrocytosis accompany cyanotic heart defects and, while up to a certain level they represent a desirable compensatory mechanism (i.e. enhance oxygen carrying capacity), when the PCV raises above 60-65% reduced peripheral perfusion secondary to elevated blood viscosity become apparent. The recognition of these fundamental physio-pathologic aspects suggests the adoption of the following palliative interventions. First, in order to reduce the frequency and significance of “tetralogy spells” the owners must be educated on the importance of significant exercise restriction, that extends to avoiding, as much as possible, any situation that could cause the patient to become excited. Second, the adoption of a -adrenergic receptor blocker is also important, especially a non-selective 1- and 2-blocker such as propranolol. Propranolol helps reducing myocardial oxygen consumption, has antiarrhythmic effects and, by blocking the two receptors expressed in the vessels of the skeletal muscles, helps blunting the described exercise-induced drop in systemic vascular resistances. Furthermore, the PCV must be closely monitored in these patients and interventions considered when it rises significantly above 60%. While frequently it is sufficient to instruct the owner on how to prevent their pet from becoming dehydrated or how to administer subcutaneous fluids, in other instances IV fluids, phlebotomy, or the use of the bone marrow suppressant drug hydroxyurea must be contemplated. When these palliative medical interventions do not yield the desired effects in terms of patient’s and owners’ quality of life or expectations, a palliative surgical intervention can be considered. Several operative protocols have been described, one of which being the Blalock-Taussig operation. All involve the creation of a systemic-to-pulmonary shunt that increases pulmonary blood flow, so to increase blood oxygenation. In summary, patients with tetralogy of Fallot require an accurate (anatomic and functional) diagnosis, periodic PCV monitoring, and a significant modification of their life-style. With adequate palliative interventions and medical guidance, a dedicated owner can help these patients live an acceptable life. 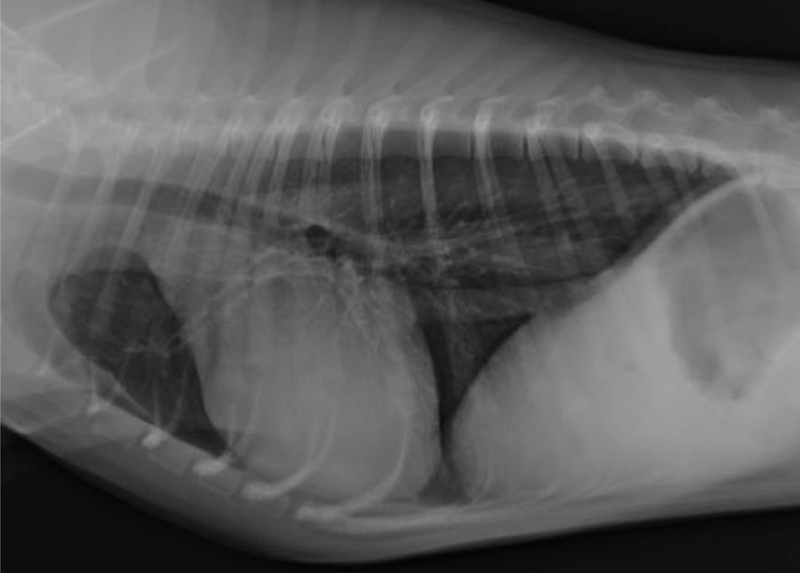 Cardiogenic cyanosis is a relatively uncommon finding in dogs and cats. Congestive heart failure per se rarely causes a significant degree of cyanosis. Cyanotic congenital heart defects are uncommon compared to non-cyanotic congenital heart diseases. Cyanosis is more difficult to appreciate in anemic patients.